I think I might be repeating myself too much but here I go again. 18th June 2016; Hayley take to Royal Children’s Hospital Melbourne. 19th June 2016; The scans found something. 20th-23rd June 2016; Fasting, tests, fasting, scans, more tests, more scans, maybe an x-ray. 23rd June 2016; We are told that Hayley has cancer. 24th June 2016; Hayley goes under the knife to have a PORT installed. 25th June 2016; Chemo begins. 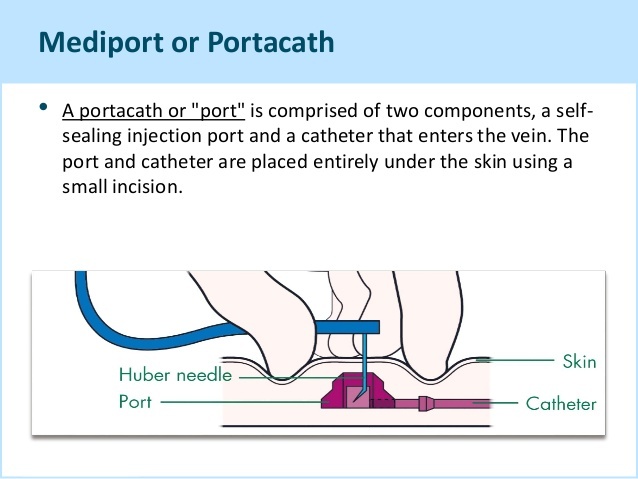 So, what is a PORT (port-a-cath)? In other words. 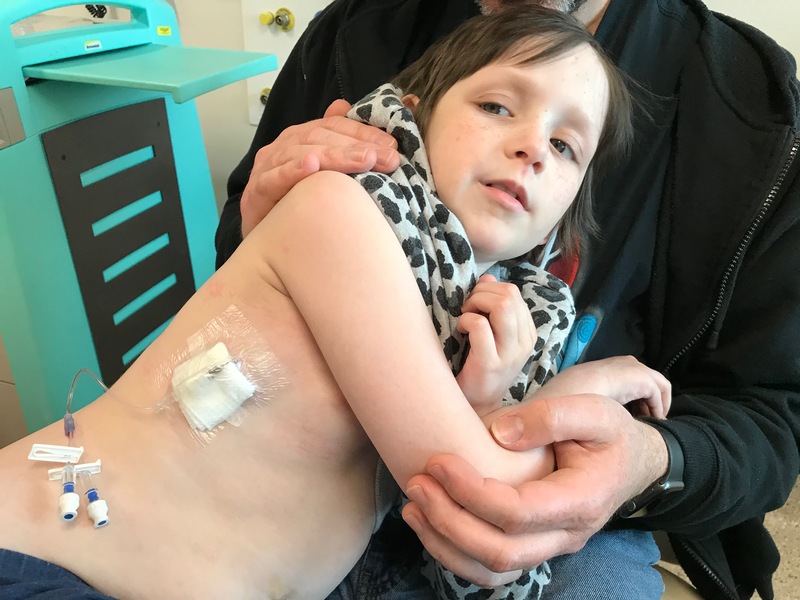 Instead of several needles, etc every hospital stay they would access (insert special needle with multiple tubes off it) into the port and pump the chemo, etc, etc through there. They could even pump multiple things in simultaneously when needed. In this picture you can see the Saline drip, Morphine and something else I can’t remember at the moment all being pumped in via the post. Hayley received all her chemo this way (except the daily, at home, oral one during maintenance). 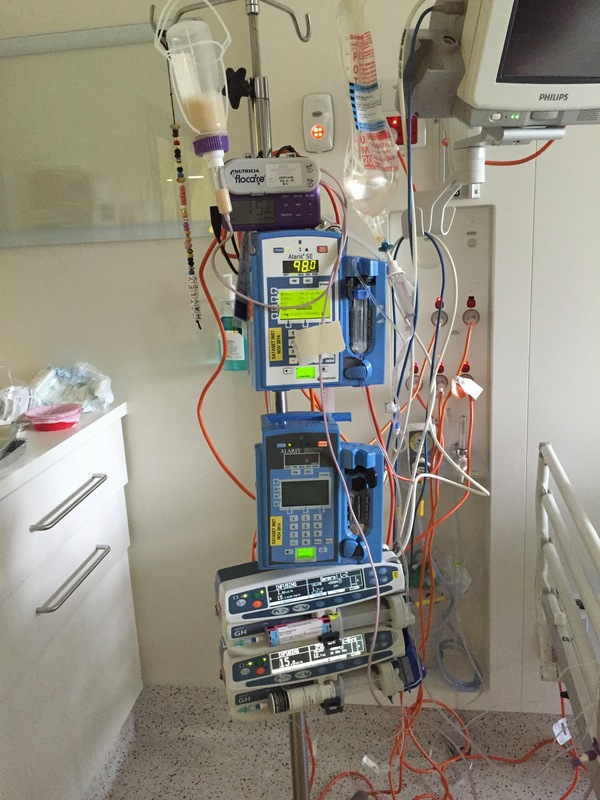 As well as blood transfusions, ketamine, pain killers and anti nausea medications. The purple machine is pumping food in through the feeding peg, different story. You can also see hanging on the left of the pole a string with beads. Every procedure earns Hayley a bead. This photo was pretty early in the journey. Once accessed, the pole was with Hayley everywhere. If she needed the toilet, which was often sudden and urgent with all that liquid being pumped in, the pole was with her. Mad panic to unplug all the machines from the power point a try to hook them over the top without tangling, grab the pole with one hand, pick Hayley up with the other arm and get there as quick as possible. When Hayley got stir crazy sitting in her hospital bed we would put her a her wheel chair and try to steer it one handed while dragging the pole too. Occasionally she was feeling strong enough to walk. You couldn’t walk far as the batteries on the machines would start to beep when they were running low. Also, once accessed, Hayley wasn’t allowed off the ward. The doctors and nurses were so excited the day of this photo. It was the most they had seen Hayley walk in quite a while. I remember seeing some very shocked expressions as we walked past the doctors’ office and they saw her through the window. 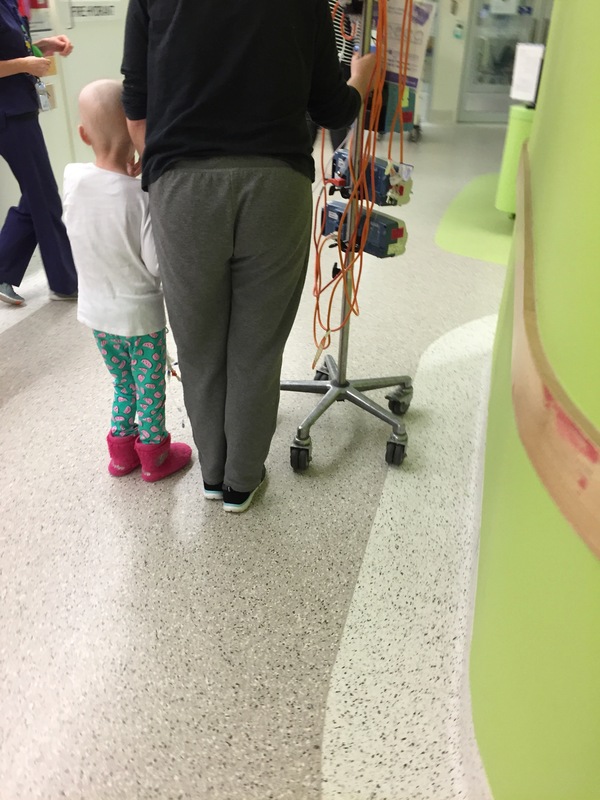 27th November 2017; Hayley is accessed at Royal Children’s Hospital Melbourne to receive her last Chemo dose there. 17th December 2017; Hayley receives her last oral chemo at home. Also her last ever chemo. 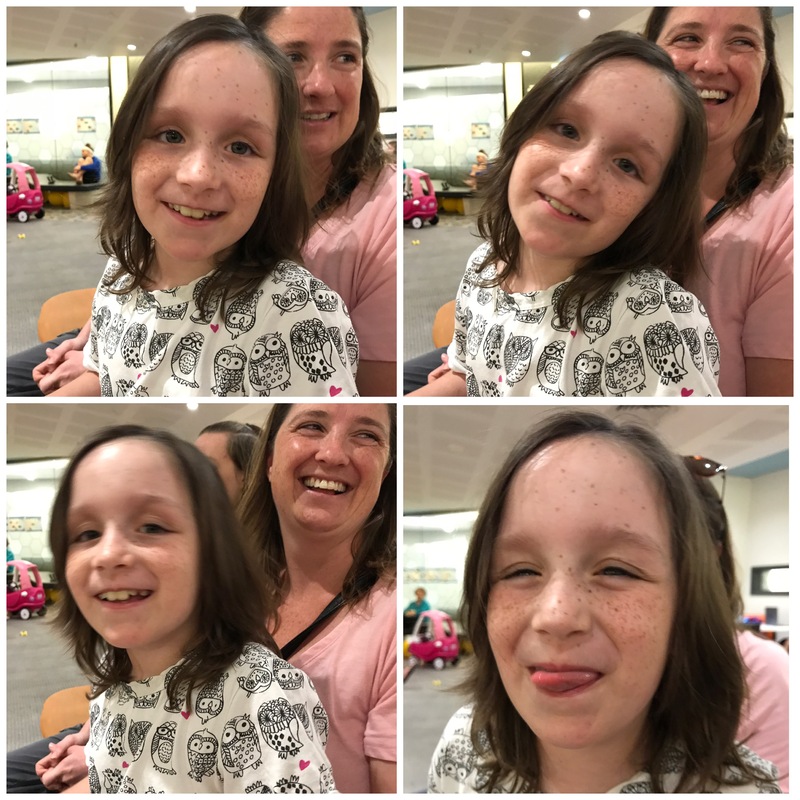 23rd December 2017; Hayley is told COMPLETE REMISSION!!!!! 3rd July 2018; MRI says still all clear. So 6 months of all clear means Hayley goes on the waiting list to have Port removed. She is very happy but over time got a little impatient. LOL. Although it still would hurt when bumped, which happens with a healthy kid who is getting healthier, cheekier and more active. 18th September 2018; A phone call. 19th September 2018; The PORT IS OUT!!! Big THANK YOU to the awesome team at Lady Cilento Children’s Hospital in Brisbane. There was a 5 second protest as a bit of anxiety kicked in as the anaesthetist approached but the when I came to see her in Recovery she was sitting up, smiling and eating an icy pole.